Cartoon representation of the working mechanism of the polymer-nanofiber NanoVelcro chip. UCLA scientists have developed a NanoVelcro Chip that can detect and isolate single cancer cells from patient blood samples for analysis. Researchers at UCLA report that they have refined a method they previously developed for capturing and analyzing cancer cells that break away from patients’ tumors and circulate in the blood. With the improvements to their device, which uses a Velcro-like nanoscale technology, they can now detect and isolate single cancer cells from patient blood samples for analysis. In recent years, a UCLA research team led by Hsian-Rong Tseng, an associate professor of molecular and medical pharmacology at the Crump Institute for Molecular Imaging and a member of both the California NanoSystems Institute at UCLA and UCLA’s Jonsson Comprehensive Cancer Center, has developed a “NanoVelcro” chip. When blood is passed through the chip, extremely small “hairs” — nanoscale wires or fibers coated with protein antibodies that match proteins on the surface of cancer cells — act like Velcro, traping CTCs and isolating them for analysis. CTCs trapped by the chip also act as a “liquid biopsy” of the tumor, providing convenient access to tumor cells and earlier information about potentially fatal metastases. Histopathology — the study of the microscopic structure of biopsy samples — is currently considered the gold standard for determining tumor status, but in the early stages of metastasis, it is often difficult to identify a biopsy site. By being able to extract viable CTCs from the blood with the NanoVelcro chip, however, doctors can perform a detailed analysis of the cancer type and the various genetic characteristics of a patient’s specific cancer. 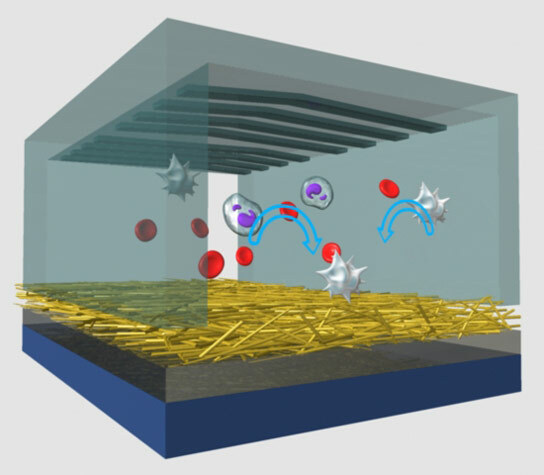 Tseng’s team now reports that they have improved the NanoVelcro chip by replacing its original non-transparent silicon nanowire substrate inside with a new type of transparent polymer nanofiber-deposited substrate, allowing the device’s nanowires to better “grab” cancer cells as blood passes by them. The researchers’ paper on their improvement to the chip was published online February 22 in the peer-reviewed journal Angewandte Chemie and is featured on the cover of the journal’s March 2013 print issue. Using the new assay on patients’ blood containing circulating melanoma cells (CMCs), Tseng’s team was able to isolate and preserve single CMCs. Melanoma is a deadly type of skin cancer that is prone to spreading quickly throughout the body. The ability to capture and preserve single CMCs allows doctors to analyze melanoma cells’ DNA structure, determine the genetic characteristics of the patient’s cancer and confirm that the circulating cells remain genetically similar to the tumor they came from. Dr. Roger Lo, another key Tseng collaborator and an assistant professor in UCLA’s department of medicine, division of dermatology, and department of molecular and medical pharmacology, was also optimistic about the new method. “This scientific advancement — being able to capture the melanoma cells in transit in the blood and then perform genetic analysis on them — will in principle allow us to track the genomic evolution of melanoma under BRAF-inhibitor therapy and understand better the development of drug resistance,” said Lo, who is also a member of the Jonsson Cancer Center. 1 Comment on "NanoVelcro Device Grabs Single Cancer Cells from Blood"
Scale it up and take out ALL the cells!